The difference between a photographer and a snap-shooter is determined by the ability to consistently achieve the desired outcome through the use of tools, techniques, and artistic vision. Quite often, available light is not sufficient to fill your subject’s shadow areas, or the light may be too intense for your desired outcome. The best way to compensate for light deficiencies is to add reflectors to your set. We can also explore a close cousin to the reflector, the diffuser. Diffusers are used to soften or change the character of available light. Reflectors and diffusers are relatively inexpensive, portable, and can often be fabricated with inexpensive materials. Let’s take a look at each and a few examples of how they can be employed on your next photo shoot. Reflectors are commercially available in various sizes and forms from practically every photographic supply venue. Reflectors are commonly found as an umbrella, which needs to be attached to a clamp in front of a studio light, or as a hand-held device, which is more portable, but often requires an assistant. For the purpose of this article, we are going to concentrate on the portable, hand-held reflector and leave the umbrella for our studio lighting topic. The most common style of reflector is the collapsible reflector, which usually has a different color on each side—usually a combination of white, black, silver, and gold. When shadows plague your shot, there are essentially two solutions: add more lights or redirect the light you already have available. Common areas that are affected by shadows in portraits may include the areas beneath a subject’s facial features, such as beneath the eyes, nose, and chin. Reflectors are used by bouncing the available light and filling the shadows with highlights. It is best to use an assistant to manipulate the reflector to bounce the light, which is inversely proportional to the photographer’s position. In other words, if the photographer is shooting from a low angle, then the reflector should concentrate on reflecting the light down. 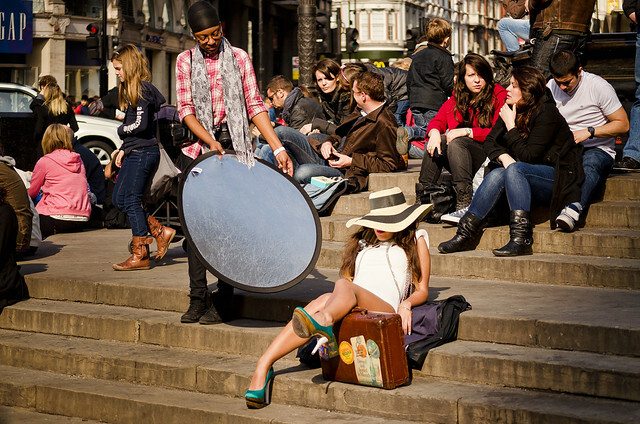 If the photographer is shooting from eye-level or higher, then the reflector is often held from a lower perspective. Of course, there are no hard rules, and the environment dictates the best perspective to use. Diffusers are also widely available from a variety of commercial vendors. Diffusers are used when the available light is too harsh for the subject and the subject has hard highlights that need to be softened. A diffuser is a piece of material mounted to a frame that reduces the light intensity through absorption. The diffuser is held between the subject and the light source by either an assistant or a frame stand. The diffuser is usually made of white or gold rip-stop material but may also be construction from screen materials. Diffusers can easily be constructed from PVC pipe and clamps by making a simple frame from 1/2 inch PVC with one or two cross-members added for support, depending upon the size of the frame. Once your frame is constructed, secure the material to the frame with plastic clamps, and viola, you have a simple diffuser for about the same price as a decent lunch. Professional photographers usually have an entourage of assistants with a variety of reflectors and diffusers when shooting outdoors. The key to capturing professional photographs lies heavily with the photographer’s ability to use light to enhance the photograph and to overcome environmental obstacles. Start small and experiment with angles and reflector colors to achieve your desired effect, and document the results for future reference. Pranav Bhasin is an avid photographer and provides photography learning tutorials on his blog (lifeblob dot com). He also likes to interact and help amateur photographers. This reminds me of the first I used reflectors. I assisted for a prominent Austin wedding photographer when she asked me to aim a round reflector at the bride’s face to lighten it up. I learned a great deal from her. I’ve been wondering ever since how to integrate it into my shooting practices/habits. Thanks for your post on reflectors! I have been using natural light without reflectors for a while, but I am considering buying some so your post is important so that I can get to know how to use them best! Photo of man at tops looks like it belongs in a magazine or in a photo contest. Excellent shot.